We love funny puns here at LaffGaff, even ones that make us groan, and these collections are as hilarious as they come. So if you're a pun lover like us then you've come to exactly the right place! You're bound to have great pun reading them - even the cheesy ones are pretty Gouda! So we hope you have as much fun reading them as we did collecting them. These birthday puns are perfect if you’re making a birthday speech, just looking for something witty to write in a birthday card, or just for fun. 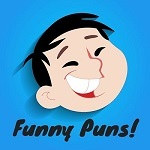 A great selection of funny puns for kids. And of course, they're also suitable for the big kid in us all too! And we're all big kids here at LaffGaff! If you're like us then you just can’t get enough of punny jokes! So here's even more hilarious puns just for you. Take a humorous look at history with these hysterical historical puns. Funny dinosaur puns will never be extinct. And they're certainly not dino-boring! So here's a collection of all our favorites. These funny bowling puns will bowl your over! There's no gutter humor here, they strike just the right balance! Donut worry, these funny food puns are all in the best possible taste. So take your thyme and enjoy reading them! Excuse us for butting in but we're not kidding, these goat puns are definitely the Greatest Of All Time. These wizard Harry Potter puns are truly magical. They could make even the stoniest of stony faces laugh and are bound to cast a spell. Math puns are an integral part of LaffGaff. In fact, we find math humor so add-ictive we thought we'd bring you another page packed full of funny math puns to make you groan! These spud-tacular potato puns certainly aren't small fry! They're so a-peeling, they're sure to keep you amused. Science puns always get a reaction. And these are no exception. Yes, they definitely won't zinc without trace! Shell-ebrate humor with these turtley awesome turtle puns! They're sure to bring you out of your shell, so don't be slow - read them now! These hilariously funny elephant puns are truly unforgettable so don't be a Dumbo - check them out right now. Ivory much doubt you'll be disappointed! Sometimes a joke's so bad you just have to laugh. If you like groan-worthy puns, you've got to see these! Celebrate Halloween with a smile (or maybe a groan!) with these hilarious Halloween puns! These hilarious swimming puns and jokes definitely won't send you off the deep end as they're a stroke of genius, so dive right in! We thought it would be a nice jester to bring you these funny clown jokes and puns! We've branched out to bring you these tree-mendous tree puns and jokes! If you enjoyed these funny puns, be sure to check out the rest of LaffGaff for lots more fun and laughter. We have a huge selection of funny jokes, trivia questions and answers, funny quotes, quizzes, brainteasers and riddles, and pick up lines, so there's something for everyone!